Let’s face it — as women, we always try to do our best to look as lovely as possible. From makeup to clothing we always try to achieve a great look. A significant part of our appearance is the hair. An appropriate hairstyle can change Cinderella from a peasant little girl into a princess. There are many accessories out there for long-haired women to choose from. Hair bows, clippers, or headbands, there is a lot to select. You can start by checking our list below. Looking for that perfect ponytail holder that will complete your look? If you have thin to medium thick hair, you can give the Kenz Laurenz elastic ponytail holder a try. They are made from stretchy elastic for a no-damage hold. These are ideal for securing ponytails tight while playing sports or working out, for example. The fabulous thing about this set is that it comes in a pack of 100 holders. We know how annoying it is when our hair bands go missing without a trace. With this set, you can rest assured you will always find one when you need it. SlideProof hair accessories are designed for a non-slip grip to help secure hair as best as possible. This makes these elastic ties super useful, allowing you to maintain your buns or ponytail in place all day long, so that’s one thing less to worry about. They are silicone lined 4mm elastics that will hold your hair securely, but also comfortably. The set comes in 10 elastic ties, in black and gray colors. Anyone with long hair knows what it’s like to take your elastic holder out after a long day, and the pain you feel on the scalp. A gentle holder is essential if you want to avoid that feeling. The truth is that if there is one thing you can not have enough of, it’s a reliable hair tie. Even if you have long, thick hair, with the Scunci Effortless Beauty Large Elastics, you are always good to go. Coming in a pack of 30 multicolor elastics, larger than the average hair tie, these are ideal for any type of hair fashion. An important aspect is that they are designed with fabric that will not slip, rip or pull. Thanks to their size you can wear one or two of these elastics on the wrist, always being ready to pull up your hair. Are you looking for elastic hair ties that do not break, damage, or tangle your hair? You can try the soft, metal-free elastics provided by Janecrafts. The set is called Cute Girl Elastic Hair Ties because the bands come in multiple lively colors. However, they are not just for girls, or for specific ages. You can use them for a 3-year-old, or for a grown woman, as everyone needs a little color in their lives. The multiple bright and also neutral shades can easily complement any style. The only difficulty you might face is choosing the tone of the day. invisibobble comes with a traceless hair tie that has been designed in a revolutionary spiral form, which makes it an easy to use styling accessory for various hair-styles. The hair ring is made out of artificial resin, which renders the task of removing it from the hair a piece of cake. Also, thanks to this material, you will not face tangles. The qualities of this product are multiple. It offers an excellent wearing comfort, providing a secure grip at the same time. It is water-repellent, non-soaking, and also fits all hair types. It can be a stylish wrist bracelet, as well. If you are looking for small elastic bands, with a large variety of candy colors for your baby girl, search no more! eBoot comes with a pack of 2000 pieces of elastic rubber bands of multiple vivid colors to choose from. These rubber ties are made from high-quality TPU material which offers excellent flexibility and can be used repeatedly. They are also great for beginners who learn to tie up their hair. These multicolor rubber elastic hair ties measure around 2 cm in diameter, and they are 1 mm in width. They come in a small bag, which is convenient for storing. You can style your hair comfortably with the Goody Ouchless Latex Elastics. They are made from high-quality latex and come in multiple sizes, in order to meet your every need. These hair ties provide increased comfort compared to traditional ponytail holders. They can keep your hair tight securely and conveniently all through the day, without causing any harm to it. The product comes in a pack of 30 pieces, in brown color, and they are suitable for all hair types. These items are great if you want to maintain your hair securely and comfortably in place, with no fear of tangles, or any other damage. ElasticU brings the Premium Polybands to the market, with a pack of 70 strong, reusable hair elastics. These are packed in a reclosable bag for convenient storage. This product features elastic bands of 30mm to 1.15-inch long, but other sizes from this manufacturer are available as well. You can use them for various hairstyles such as ponytails or braidings. These elastics feature a few essential qualities. First of all, they are reusable, and they offer a secure hold. They have great flexibility, so they stretch easily. Designed with a clean, smooth feel, they are very simple to take off, without harming the hair. Scunci comes with a set of no damage elastic hair ties, which are the ideal companion to have on you, and with you every day. They are soft, metal-free elastic bands, that can keep ponytails tight while you work, play, work out, or perform any kind of activity. This model beautifully highlights and complements shades of blonde hair, and it will help you instantly change your hairstyle. Thanks to the high-quality material, they will not slip and will hold your hair tight. Although they are non-slip, they are very easy to take off and let your ponytail free at the end of a busy day. Being able to choose a lot of colors, you will surely like the Kitsch hair coils. They look nice both in your hair and on your wrist. The loop is gentle on your locks, but it also holds your ponytail in place comfortably. These items spread the pressure of a standard hair rubber band over a wider surface, preventing breakage. One set includes four coils. To keep them clean, use mild soap and water. After repeated usage, they will stretch. To bring the coils to the original size, place them in a cup of warm water, or use a hot blow-dryer. Hair ties are a common accessory for a great number of people. We most readily associate them with women, since some of them tend to keep their hair long and the majority of types of hair ties are intended for their use. But many a comic book guy or even rocker has also been known to wear a ponytail, tied together with an elastic band. For this last category of users, the practical aspect will take primacy when choosing a hair tie, but ladies often go for accessories that will complement their wardrobe or looks. Finding the best hair tie in this instance might not be as straightforward, especially since there is quite a deal of variety of items to choose from. It is crucial to do a bit of research in order to ensure that you make the right pick. However, if you’re short on time and can’t go through a lot of hair tie reviews, then you might want to parse through our short buying guide as we’ve condensed the main things to know for finding a good hair tie. We were actually surprised with the large volume of info we’ve managed to find on what are essentially pieces of elastic, and this is mainly due to the many different styles available, each one with its own set of particularities. The ubiquitous elastic band is known to be worn by celebrities as varied as Audrey Hepburn and The Simpsons’ Comic Book Guy. This design is generally composed of an elastic material that is covered in fabric to prevent pinching and pulling. These come in all sizes, colors, and can cover quite a range of styles but the most important distinction, at least in regards to comfort and durability is whether a metal clasp is used to tie it together or is just glued. The metal clasp will naturally make it harder to come apart, but this can sometimes become entangled if not removed carefully. The elastic band is well appreciated for providing a good hold, with very little pinching and pulling. However, these are not the most comfortable hair ties out there, especially if you decide upon a small size, to maximize hold. A newer addition to the hair tie family, these consist of an elastic band surrounded by loose, scrunched up fabric that is soft to the touch. These are exclusively worn by the fairer gender and are known to provide the best comfort from all the types available. This will make a good pick especially for those who are easy to develop headaches if their hair is tied too tight. 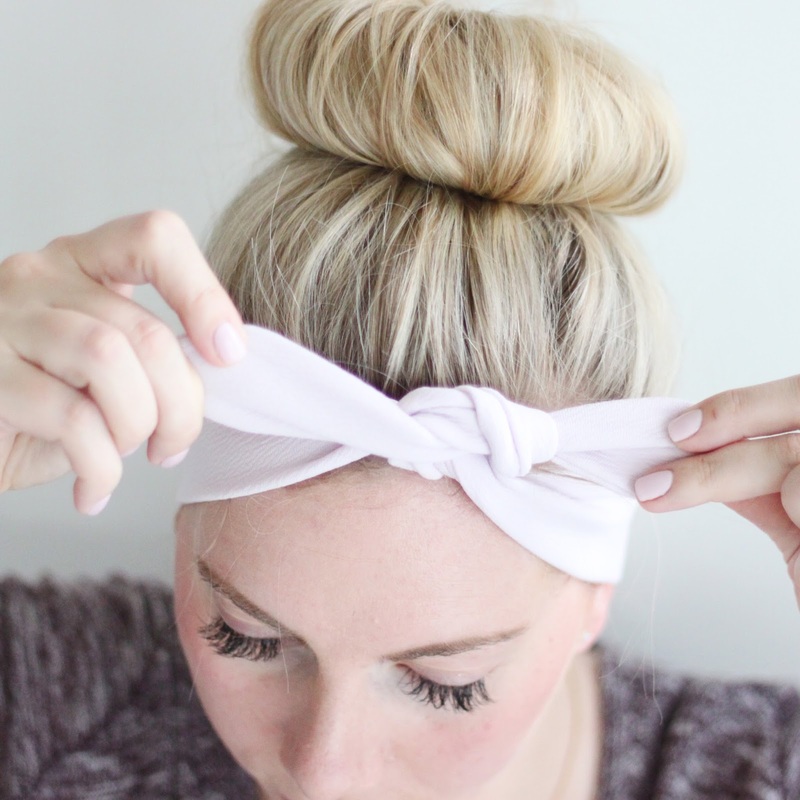 The scrunchie will allow it to stay loose enough not to pull on the scalp, but it won’t provide the best hold as their elastic is almost always weak. Unlike the elastic ponytail holder, this is far from being an item to be worn in any situation and might appear too juvenile to be paired up with something like a business suite or for a formal occasion. It is also considered to be a fad item, so buyers are well advised to be aware of current trends if they want to be fashionable. There is almost no limit to the possibilities manufacturers and fashion designers have for decorating the elastic band that forms the main body of a hair tie. Floral motifs are always popular, but you can find these items covered in anything from fabric bees, butterflies, to Batman symbols. Getting the design that fits you the best will come down to personal taste, but there will always be good hair ties to cover any particular situation which can be found for sale at almost all beauty shops. If you’re after a professional look, for example, you can go for a discrete band in a dark color, while taking care that all the strands of hair that make up the ponytail stay in place. While not technically a hair tie there are too many awesome hair clips out there for us to completely ignore this category. These are made from either durable plastic or metal and can range in style from the ubiquitous small clip that attaches much like the piece of office supply bearing the same name to elegant banana clips used to keep the hair at a certain level. Depending on their design, clips can allow for a deal more freedom when it comes to hairstyle, and are favored by young girls and women who dedicate a lot of time to their appearance. Conversely, the ponytail is considered one of the most convenient ways in which to arrange one’s hair and takes very little time and effort while ensuring that the bangs won’t get in your eyes. Since we’re quite literally living in a material world, durability will always be a factor. The elastic ponytail holder with a metal band tends to score top marks in this regard, with the hair-friendly scrunchy coming in last, especially if acrylic is used for the fluffy part instead of elastic fabric. The ponytail holder can also be bought in bulk and will last you for quite some time, canceling the need to keep buying hair supplies if this happens to be a bothersome activity for you. The price won’t really be an issue for this particular type of product, as they tend to be cheaper than most consumables. Hair tugging and breakage aren’t such big problems today as they were in the past and most good brands will offer a no-tangle guarantee. There’s really no reason not to take advantage of this and go for maximum comfort, as a hair tie that doesn’t do a good job in this regard can cause quite a deal of grief to the user. You wouldn’t expect it from such an apparently insignificant item, but those that pull too tightly on your hair have been known to cause migraines (this is a piece of information that surely bears repeating).